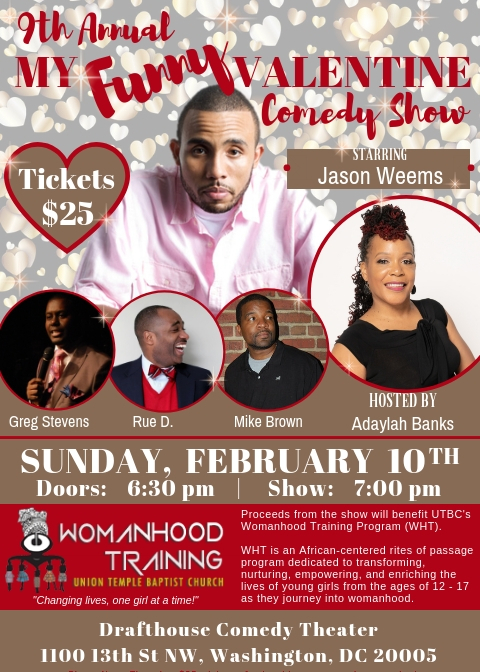 My Funny Valentine Comedy Show (MFV) is a fun, entertaining, and refreshing stand-up comedy show. The shows are balanced with an array of comedic styles to capture the audience’s attention while leaving them laughing and craving for more! Every year, MFV brings comedians together in an effort to raise funds for a local non-profit organization. This year, proceeds from MFV will benefit UTBC's Womanhood Training Program (WHT). WHT is dedicated to changing the lives of young girls ages 12 - 17 as they journey into womanhood. My Funny Valentine Comedy Show appeals to a mature adult audience 18 years old and older.